Welcome to Week 23 of Year 8 here at Paint Party Friday! This week our random number generator chose #4 - Frauke Christiansen of Luettes Blog. 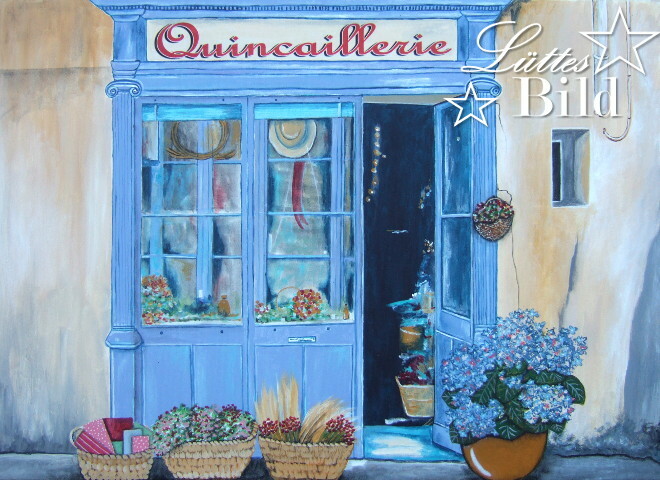 Frauke painted this lovely little French household goods store. You feel like you're in France just looking at it! Have a lovely and creative week! Happy PPF. I really do like this painting. It reminds me of the puzzles we do here. Love Frauke's blue doors. Thanks for hosting! I absolutely adore the store-front! Really beautifully done! What a beautiful painting! And it is my favorite shade of blue. WOW! Fills my eyes, it does. What a charming painting with such lovely colors! Really excited to have found this challenge.